Ernesto Ramos Nieto – Biography. 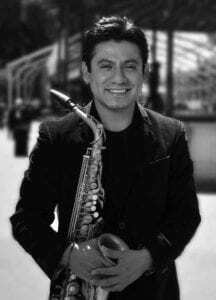 Born in Mexico City Ernesto began his musical studies at the age of 8 playing Clarinet in the Xochimilco Youth Symphony where he began his development as a musician. He began his formal studies in Clarinet at the Superior School of Music but after a few years changed to the Saxophone studying at the Jazz Workshop. Since then Ernesto has become one of his country’s greatest Jazz musicians. He has participated in various international jazz festivals such as the International Jazz Festival Acapulco, Irapuato International Festival of Playa del Carmen, Jazz Festival Tonic Guadalajara, Jazz Festival Queretaro, International Festival Jazz San Miguel de Allende, International Jazz Festival Xalapa, Mexico Cultural festival of Chihuahua, etc. He has played with all the greatest Mexican musicians like Chilo Moran, Father Alvaro Lopez, Francisco Tellez, Agustin Bernal, taken clinics with Carlos Tercero and performed with many other internationally renowned artists including saxophonists Justo Almario, Jim Odgreen, Tim Mayer and Bill Pierce, trumpeter Americo Bellotto, guitarist Marc Cooper, drummer Antonio Sanchez, bassists Eddie Gomez and Fernando Huergo, and vibraphonist and composer Victor Mendoza. He’s been part of the orchestras backing Mexican singers such as José José with whom he toured the EU, Egypt and Central and South America. With Juan Gabriel and Susana Zabaleta he toured Japan and he has also been in the Orchestras supporting Armando Manzanero, Yuri, Emmanuel, Alex Sintek and Foreign singer Jose Luis Rodriguez “El Puma”. In 2005 and 2006 he was awarded scholarships to study at the Berklee College of Music and the Henry Mancini Institute. He was invited to participate in the “Latino American Latin jazz band” formed by teachers and students of Berklee College of Music in Boston. Ernesto has been a Yamaha Endorser Artist since 2004 and has performed numerous clinics on their behalf. He is also an Endorser Artist for Veerkamp House, Roland Instruments, Rico Reeds, Audix Microphones, K & M, Cemex and Jupiter Wind Instruments. He performed at the Yamaha Groove night concerts in 2003 and 2008, sharing the stage with top drummers: Rick Marotta (Steely Dan), David Garibaldi, (Tower of power) Gerry Brown (Stevie Wonder), Antonio Sanchez (Pat Metheny), Dave Weckl (Chick Corea), John Robinson (Rufus), Ndugu Chancler (Santana), with bassists Will Lee, and Neil Stubenhaus; guitarists David Spinozza and Mark Williamson and keyboard player Jon Greathouse. Since 1999 Ernesto has been the musical director of the “Jazz De Mexico” Big Band. Among their many accolades, they are the first Big Band to play 10 consecutive seasons at the “Lunario” National Auditorium. The band has been nominated 2 times to Auditorio Nacional LUNAS awards in the category of best jazz concert. The first album recorded by the “Jazz De Mexico” Big Band with Ernesto as Musical Director was titled “Revival”. In 2008 he recorded his second album titled “Manzanero Big Band Jazz De Mexico” and in 2009 the third album titled ‘Before or After”. 2012 saw their fourth recording “Soundtrack a Note for Resilience and in 2013 the band released their fifth album titled “Flavored Mexico”. Ernesto currently operates his own recording studio called ‘Ramos Record Studio’ where he has recorded the ‘Jazz De Mexico’ Big Band among many others. In 2012 he was invited to Europe play with the jazz quintet ‘5th ELEMENT’ performing at the Belfort Jazz Festival in France. In 2014 Ernesto was invited to give a concert with the ‘Jazz De Mexico” Big Band at the Tonic International Jazz Festival in Guadalajara where he also gave a solo concert alongside such top international musicians like Miguel Zenon and Alex Sipiagin.